Having read about Rajasthan in several books and heard a lot about the grandeur of Forts and Palaces of Rajasthan, I too wanted to experience an oasis. My wish got fulfilled when I set forth to get a wonderful trip to the princely state of Rajasthan. This time, a group of my colleagues accompanied me on the trip. The forts and palaces of Rajasthan have been living testimony of this heroic ground. The state is admired for wonderful destination cities like Jaisalmer, Udaipur, Jodhpur, Jaipur, Bikaner and Chittorgarh. Embellished with rich architectural heritage, the forts and palaces of Rajasthan have made it achieve glory in the nation as renowned tourist spot. The forts of the place showcase distinct blend of Hindu as well as Mughal architectural styles. Expressive of the bygone era, these monuments are acknowledged for the great Rajasthan history. A mark of rich traditions and culture, the monuments in the Rajasthan are one of the best ways to experience the royalty of this princely state. Starting our journey from Delhi, we reached Mandawa in Rajasthan. After taking rest, we all were excited to experience the forts and palaces of Rajasthan, so we arrived at Bikaner. Bikaner fort is also referred to as the Junagarh Fort. Built by Raja Rai Singh. The fort comprises 37 bastions that are nicely complimented with different palaces, pavilions, towers and temples. There is also an exquisitely carved Chandra Mahal. Adorned with mirrors and art works, it creates a beautiful scene. We also went to a museum inside this fort and came across a wide collection of ancient manuscripts, gems, carpets and royal weaponry. This 16th century old grand fort is a unique example of traditional Rajasthani architecture. This yellow coloured fort is now transformed into a heritage hotel. It offers a world-class accommodation with modern amenities for a royal experience. Built in 1156 A.D., the Jaisalmer fort is renowned as the second oldest fort in Rajasthan after Chittaurgarh. The interior is decorated in typical Rajput style. The bastions, ramparts and the long-stretching walls of the fort dazzle amazingly during dawn and at dusk. As we entered in this wonderful fort in Jodhpur, we were stunned to see the marvels of architecture. This majestic fort is among the finest forts of the royal land known for its imposing structure over 125 meters above rocky cliffs. It is sprawled over an area of 5 sq. km. For an easy access, there are seven gates. 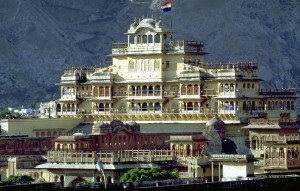 Situated in Udaipur, the City Palace is a heritage building. It showcases the finest elements of ancient Rajput culture and the arts. We entered through the ‘Elephant Gate’, which is popularly referred as the ‘Hathi Pol’. The architecture of this palace displays aesthetic beauty of the exquisite artwork. Other Attractions of Udaipur, which we visited, include Jagmandir Palace, Saheliyon-Ki-Bari, Jagdish Temple and Folk Art Museum. On our Udaipur excursion, we reached Chittorgarh. We visited The Chittaurgarh Fort which is among the famous forts of Rajasthan. Located on a 180 meter high hill in the Chittor District, this fort boasts of the finest glimpses of architectural wonder. This fort has a majestic construction that just captivated our attention. 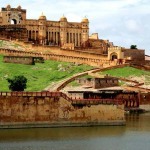 Situated in Jaipur, Amber fort is a majestic and stately fort. Built by Raja Man and completed by Sawai Jai Singh, this fort is made in while marble and red sand stone. 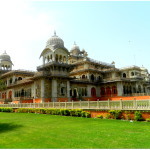 The fort houses a famous temple Jai Mandir which has Sheesh Mahal. When we entered in the mahal, we saw a beautiful hall of mirrors which are artistically set and illumine the hall amazingly. This architectural marvel is situated in Jaipur. Renowned for its five-storied pyramid-shaped facades, this palace has 953 small windows. These windows are referred as ‘Jharokha’ and adorned with tiny lattice work. The tour experience of Rajasthan still fills my heart with delightful memories.